• For the UC Davis press release and full “Three Revolutions in Urban Transportation” report, click here. • For GIF/animations that show the dynamics of changes depicted in the report, click here. • Also, for information on the ITS-Davis 3 Revolutions Policy Initiative, click here. The revolutions in question are electric vehicles, automated (driverless) cars, and shared mobility (multiple people sharing a trip, in the form of ride hailing or transit). All three of these revolutions are coming but it is not clear how fast, or which if any will dominate. But one thing is certain: to receive the most benefit from these revolutions, the most critical component is something most preschoolers know: Sharing is caring. Each revolution can provide important benefits. Electric vehicles have the potential to be near-zero CO2 emission, since they do not emit any emissions directly, and it is possible (and necessary) to decarbonize electric grids around the world over the coming decades. Automation may provide important safety benefits, particularly in the developing world where accident and injury/mortality rates today are often very high. But the analysis and scenarios in this study find that it is shared mobility that provides the largest potential benefits, in the form of vastly reduced traffic, for starters. In fact widespread ride sharing could help move global transportation into a future that not only saves energy and emissions but also decongests highways, frees up parking spaces for other urban uses, cuts transportation costs, and improves walkability and livability. It is important to emphasize that the use of “shared mobility” here does not include single-occupant ride-hailed Uber or Lyft vehicles, but only cases where multiple people share the ride. It also includes new forms of on-demand public transportation, such as small commuter buses with flexible routes. Active transportation, such as cycling, complements this scenario. The report spans eight global regions, including five major markets: United States, Europe, China, India and Brazil. The different global regions vary considerably in their starting points. For example, the United States is highly car-dependent, whereas India’s challenge will be to preserve and enhance shared mobility options they already have. Yet, across the globe, the 3 Revolutions, or 3R, scenario holds the most environmental and societal benefit. 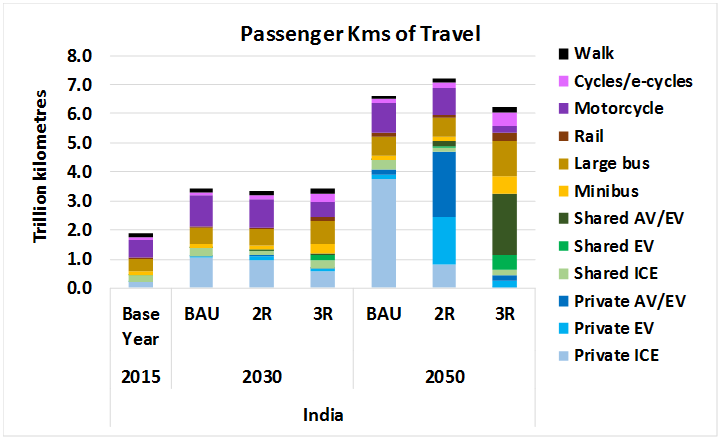 As shown in the figures below, the greater range of modes (on a passenger kilometers basis) in India is clearly evident compared to the U.S., but in both cases the overall travel levels are lowest in the 3R scenario, with a far higher share of shared mobility (saving even more vehicle kilometers) than in the other scenarios. 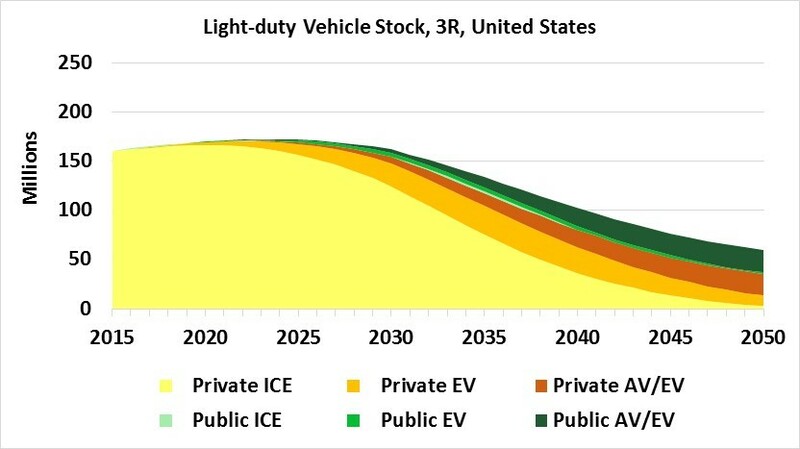 Without a concurrent shift away from private vehicle ownership and toward ride sharing, the potential for electric, autonomous vehicles to reduce traffic and sprawl are severely limited, and CO2 reductions will be significantly less than with sharing. Driverless vehicles alone could actually increase traffic congestion. Imagine people spending even more time in their cars or the possibility of zero-occupant, driverless vehicles continuously circling the streets rather than parking. Electrification is also very important. We estimate that an autonomous vehicle world without electrification or trip sharing would not cut carbon dioxide emissions at all, and might actually increase them. The report, “Three Revolutions in Urban Transportation,” comes the week before an international climate change meeting begins in Bonn, Germany. The climate talks will focus on implementing the 2015 Paris Agreement, which targets a 2 degree Celsius or lower cap to an overall temperature change from global warming. This target requires all nations to cut their carbon dioxide emissions dramatically by 2050. We note that the “3R” scenario would meet that benchmark for cities, and possibly go further. 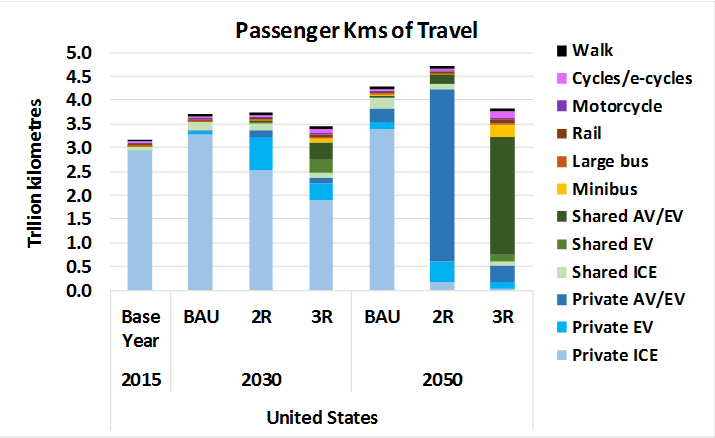 As shown in the figure below, the global urban passenger transportation CO2 emissions about 3 gigatonnes in 2015 rises to over 4.5 gigatonnes by 2050 in our BAU scenario, whereas it drops to below 2 in our 2R scenario (mainly due to electrification) and to below 1 gigatonne in 3R (due to much greater use of transit, non-motorized modes, and ridesharing in that scenario. It is also less dependent on decarbonized electricity to reach its 2050 level. The effects of 3R on travel, and the numbers of light-duty vehicles, are shown in the figure below. Due to the much more intensive use of each commercial, shared vehicle, along with greater use of transit and non-motorized modes and a general reduction in trip lengths due to more compact cities, results in more than a 2/3 reduction in the stock of LDVs worldwide (and, as shown here, in the U.S.) in 2050 compared to the peak level in 2025 (and 75% below the peak reached in 2R). This opens up tremendous possibilities for re-tasking land use, such as for more bike lanes, more dense development (given fewer parking lots) and other changes to cityscapes. 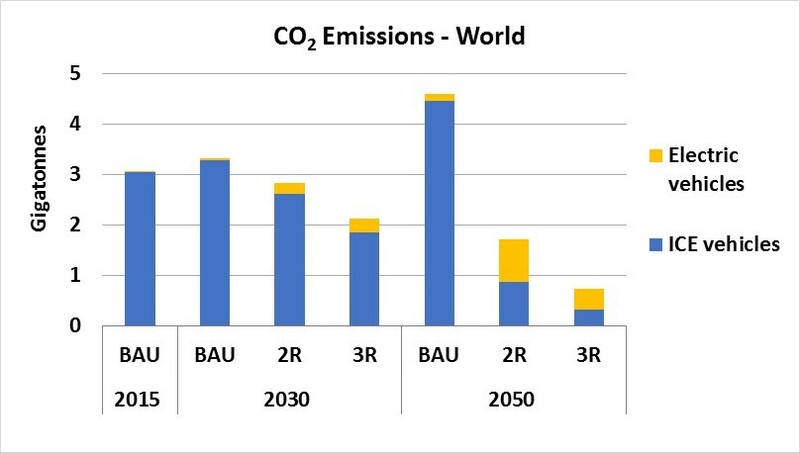 Perhaps the most surprising result is that the 3R scenario costs far less to society by 2050 than the 2R scenario, with savings beginning around 2030 and increasing per year to reach over $5 trillion per year worldwide in 2050. This includes savings in fuel costs, the costs of new vehicle purchases (given dramatically lower sales and stocks of vehicles), and the costs of building and maintaining road and parking infrastructure. Even higher expenditures on better and more extensive transit systems do not offset the other savings very much. We recognize that bringing about these revolutions won’t be easy. The report outlines needed policies, and says unprecedented levels of policy support and coordination are needed at the local, state and national levels. The report assesses policies including those that incentivize widespread adoption of electric and driverless cars, as well as support for ride sharing, public and active transport, and land-use planning that helps shorten most vehicle trips. Such policies could consider fees tied to vehicle CO2 emissions, vehicle occupancy, and possible restrictions or heavy charges on private ownership of autonomous vehicles, along with strong disincentives for zero-occupant trips. Bicycle and e-bike sharing systems also need to be encouraged along with transit system innovations. The report was funded by ClimateWorks Foundation, William and Flora Hewlett Foundation, and Barr Foundation.